Exciting stuff today! With less than a month to go until my book is released (eek! 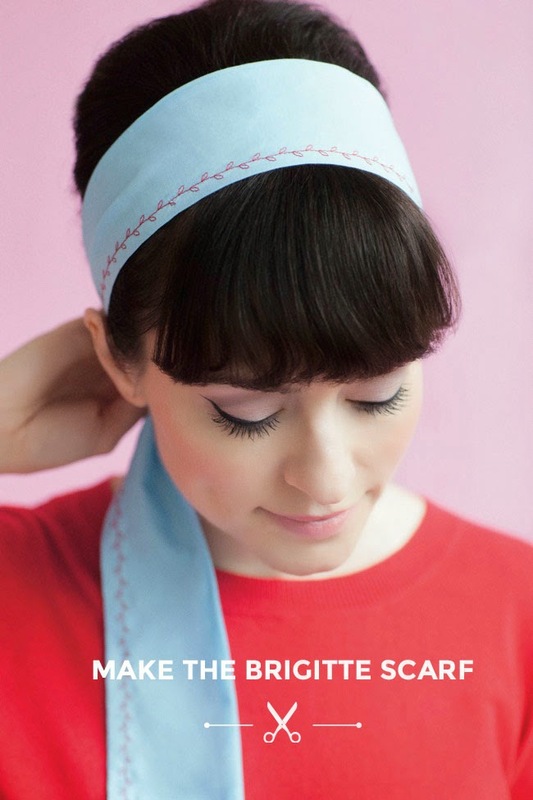 ), you, my dear readers, get a sneaky peek at the content with a project extract - the Brigitte scarf. Aaaaaand you're all invited to my online book launch party - woop! Love at First Stitch: Demystifying Dressmaking takes you from the absolute basics of threading a sewing machine through to creating a wardrobe full of gorgeous garments you can be proud to say you made yourself. As the best way to learn a skill is to get stuck in as soon as possible, each chapter gets you making a project - and variations on that project - while teaching you just enough techniques so you can make the project without feeling overwhelmed. The projects in each chapter build up in complexity until by the end you've learnt a whole loads of new skills, made loads of lovely clothes, and had a ton of fun at the same time! 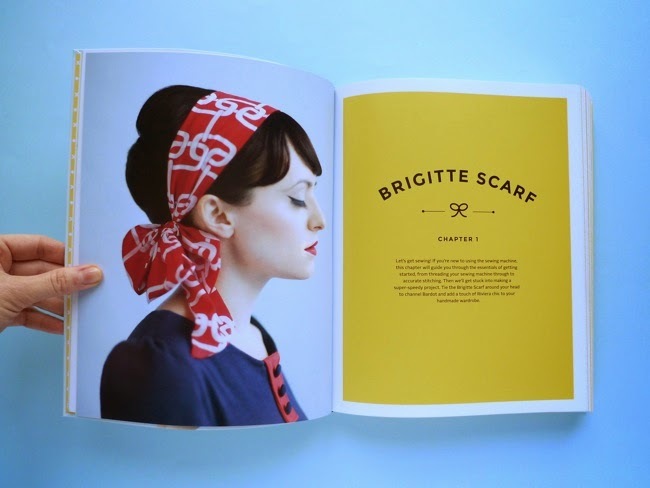 The Brigitte scarf is the very first project in the book, designed to put basic sewing machine skills into practice. 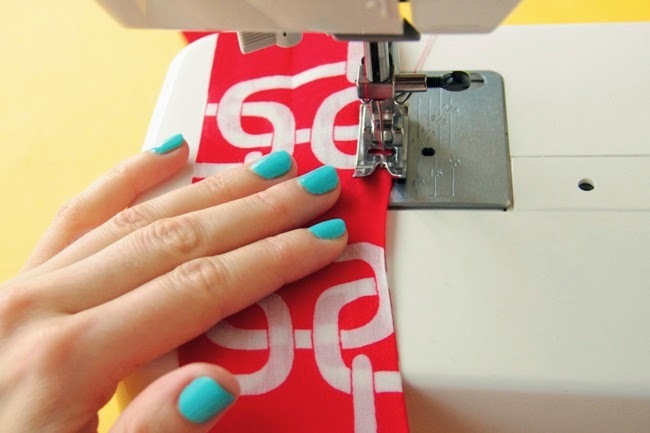 It's super simple, easy enough to be the very first thing someone makes on a sewing machine in fact, and an enjoyable speedy project for more experienced stichers too. The Brigitte scarf is inspired by Miss Bardot, bien sûr, and is a great way to add a touch of Riviera chic to your handmade wardrobe - I've just started a Pinterest board with inspiration for how to wear it. Choose a fabric that is lightweight and drapey, such as cotton lawn, voile or shirting. Lightweight silks, polyesters and blends will make a beautiful scarf, but their slipperiness can make them tricky to work with if you’re just starting to sew – test sew them first if you’re unsure. Mediumweight cottons will also work well. 1. Make a paper pattern. Draw a rectangle onto paper, 65cm (25 ½ in) long by 15cm (6in) wide and cut it out with paper scissors (remember, don't use your fabric scissors on paper). 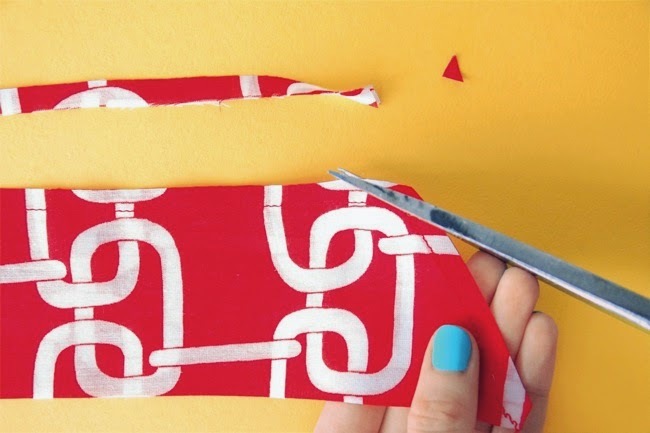 Fold your fabric in half widthways and pin the paper pattern to the fabric so that one short edge is lined up with the fold – cutting the fabric on the fold like this will result in a piece double the length of the pattern. Avoid pinning the pattern to the woven edges of the fabric (AKA the 'selvedges') – you don’t want to use those in your scarf as they are woven slightly differently to the rest of the fabric. You can adjust the shape and size of the scarf to your preference. 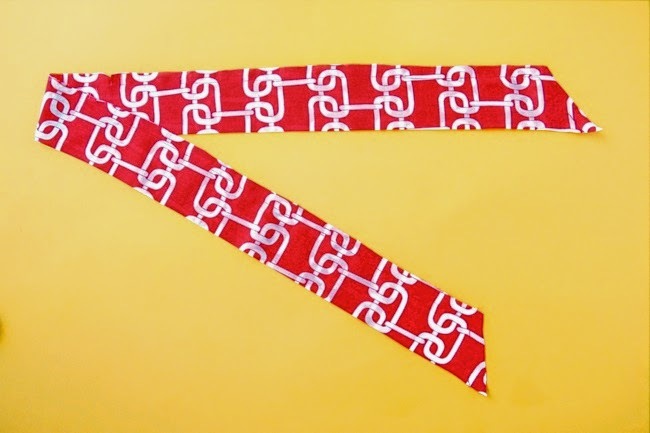 Try making a cute little neck tie by cutting your paper pattern 40cm (16in) long x 15cm (6in) wide. 2. Cut out the fabric around the paper pattern. 3. Fold the fabric piece in half lengthways. Have the side that you want showing on the outside of the scarf (AKA the 'right side' of the fabric) on the inside of the fold. Press along the fold line. If you want diagonal ends on your scarf, cut them now. Pin together the raw edges. We’re going to leave a gap in the stitching so we can turn the scarf right sides out later; make two small markings towards the middle of the long raw edge, about 8–10cm (3–4in) apart. 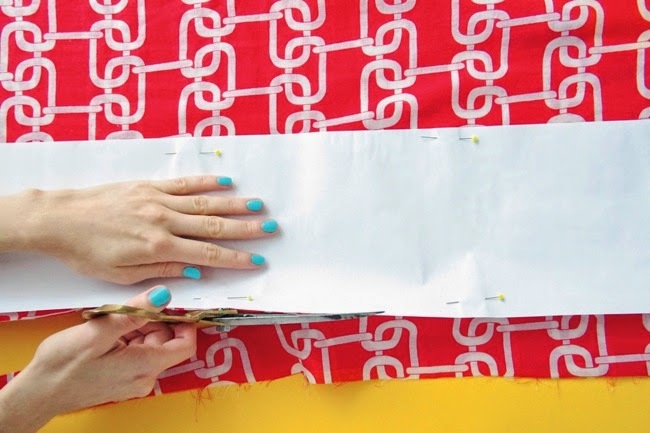 You can mark with a chalk pencil, washable pen or a tiny snip into the edge of the fabric. 4. Sew the scarf. Using a 1.5cm (5/8 in) seam allowance, start sewing from one short end, backtacking (sewing two or three reverse stitches) to secure the stitches. Pivot at the corner, and sew along the long raw edge until you reach the first marking. Backtack to secure and trim the threads. Start sewing again from the second marking, backtacking to secure, pivoting again at the corner, sewing down the other short edge, and backtacking to secure the end. Trim the threads. 5. Trim the scarf seam allowances. Trim them down to about half their current width. Snip diagonally across the corners, about 3mm (1/8 in) from the stitching and being careful not to cut through the stitches. These steps will help make the seams less bulky. 6. Turn the scarf right sides out. 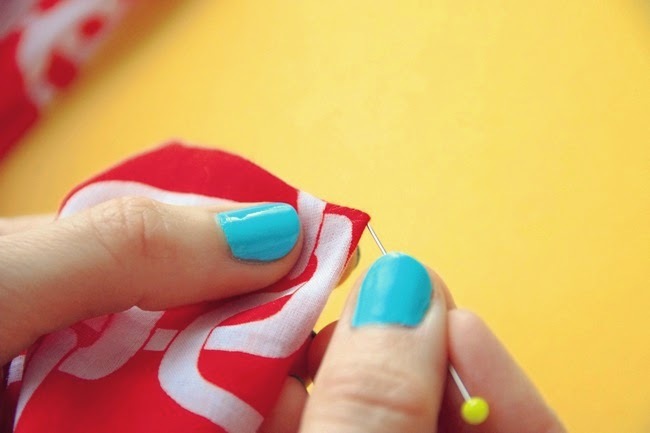 Turn it through the gap in the stitching, then use a pin to gently pull each corner out into a point. 7. 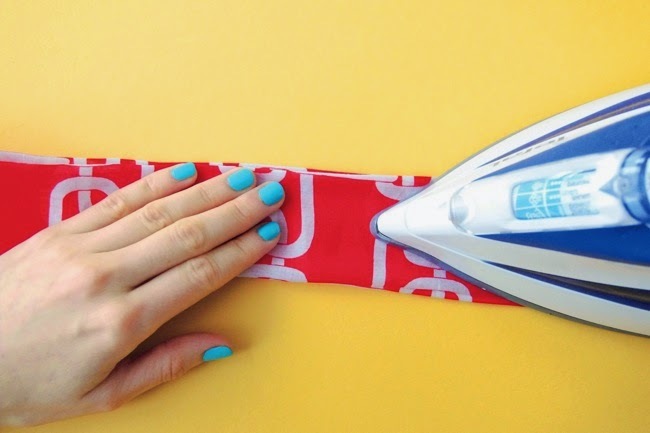 Press the seams with your iron to neaten them. At the gap, turn the raw edges to the inside of the scarf and press the folds. 8. Sew up the gap. Sew a line of stitches close to the edge along the gap to seal it, backtacking at either end. Ooh là là! You made a scarf! These days even the most basic sewing machine usually comes with a number of fancy stitch settings. 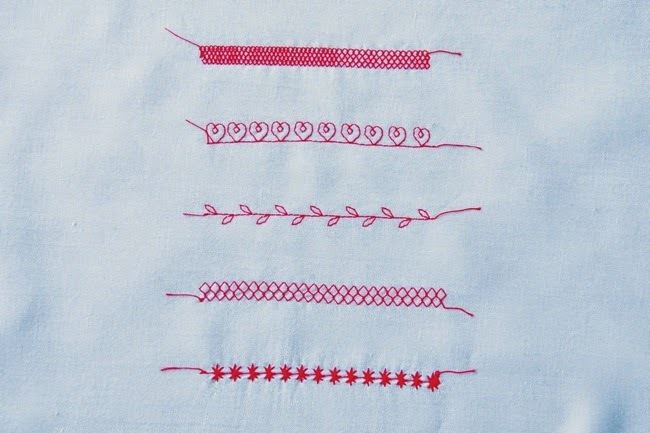 While some of these stitches are functional, many are purely decorative – from geometric patterns to flowers. Try adding a pretty stitch design to the edge of your scarf for an extra-special touch. Use a contrast colour thread so your stitching shows up against the fabric. Regular thread will work fine for topstitching lightweight to mediumweight fabrics, or you could try special topstitching thread, which is thicker and more noticeable – use it on the spool only, with regular thread in the bobbin. 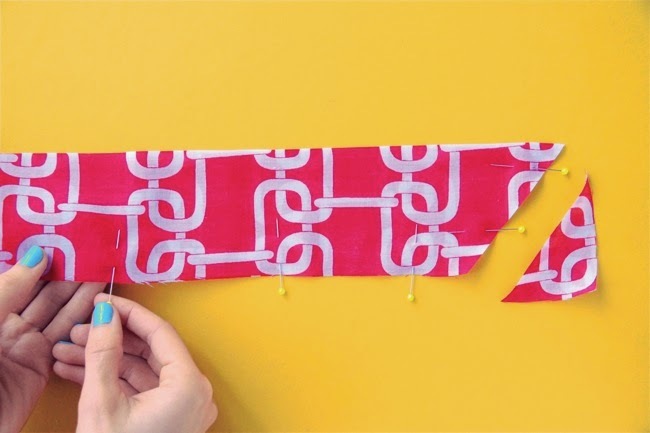 Test your stitches on a doubled scrap of fabric before you begin, adjusting the thread tension if necessary until the stitches lay nicely without bunching up the fabric. Steam pressing before and after stitching will help keep the stitches nice and smooth. 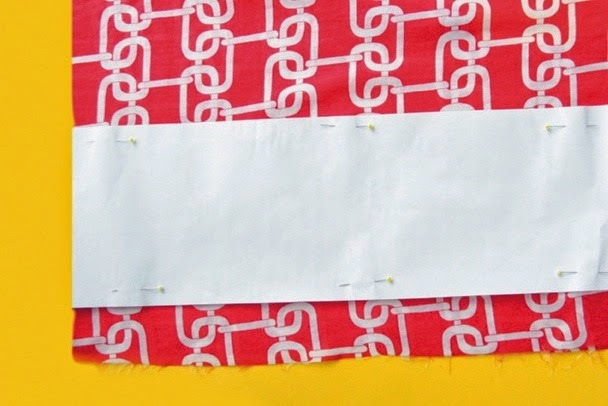 When you’re ready to sew, try to keep the line of stitching at an equal distance from the edge of the fabric, sewing as slowly as you need to and using the seam allowance guide to help you. Begin and end the decorative topstitching by backtacking with a straight stitch to secure it. Did someone mention a party? Partaaaaaaay!!! My blog readers are such a lovely, fun bunch of people, I'd love you to be part of the book launch celebrations. While it'd be pretty unfeasible for all of you to physically come together in one room, we can DEFINITELY take over the internet on the day my book is released - Thursday 8th May 2014. So how can you join in the fun? Take a photo of how you wear it - will you wear it tied round your head, as a neck tie, a belt, under a collar, on your bag...? Search for other party guests using the hashtag #LoveAtFirstStitch, meet new sewing friends and get chatting! It'd be soooo great if you could help me spread the word about the #LoveAtFirstStitch online book launch party, including to people who have never sewn before. It's not a competition as such (no pressure, just fun! ), buuut I will pick two people with stand-out photos to each win a £50 voucher to Fabric Rehab, courtesy of Quadrille. You gonna be there? 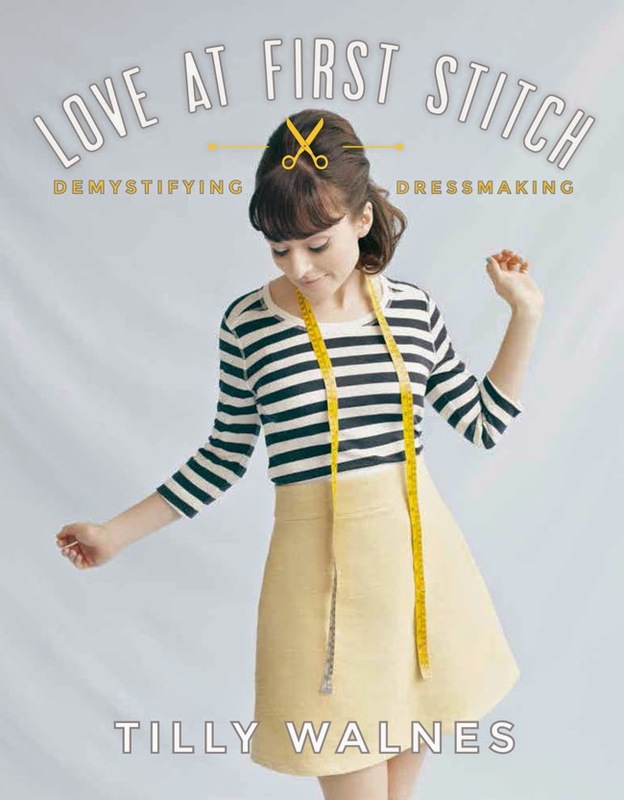 Love at First Stitch: Demystifying Dressmaking is released in the UK on 8th May 2014 (and in the US in October). You can pre-order your copy on Amazon now, or if you'd like to get a signed copy from yours truly, sign up to my newsletter (occasional special news, no spam) to be the first to know as soon as it's available to buy from my shop. Thank you so much for your support!